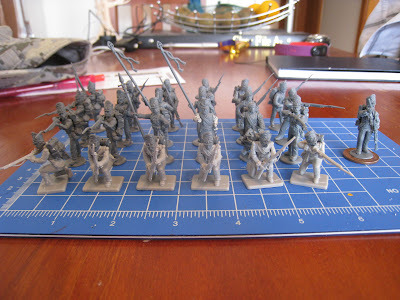 Well, progress has been somewhat slow of late; but I have managed to do some serious assembling over the past few days! 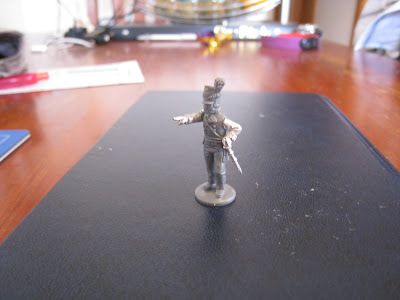 Here is what is going to be my 3rd Regiment of Foot Guards (Scots Guards). The regiment is made mostly of Perry plastics, but the front rank are the Victrix plastics. I have tried to give them the appearance that they are in square formation- or at least the resemblance of one. So the front rank are kneeling- the couple of chaps on the wings are taking cheeky pot-shots (possibly poor discipline...). There are plenty of Brown Bess muskets ready to fire behind, along with the officer dictating where the cavalry are coming from. "Hey, guys, look! Look at that! Thats a horse that is! Shoot it!" On that note, In my reading I came upon a pretty cool anecdote. The French heavy cavalry were known as Curiassers; due to the fact that they wore a metal Curiass (breastplate). Now, for those history buffs out there they know that Knights and armour fell out of favour and were superceded by the advent of Gunpowder (in the broadest terms). But, these Curiass equipped horsemen stayed! Now at Waterloo, these breastplates showed their worth, because what happened is yes, a musket ball DOES penetrate armour, but not if the ball is not shoved fully into the barrel of the gun. What happened at Waterloo (and I assume elsewhere) is that due to the need for such rapid fire, the British and German soldiers would only ram the ball halfway down, greatly reducing the muzzle velocity, meaning that the breastplate was highly effective! I've noticed, as have others, that militaries tend to follow the fashion of the day. If they can't actually follow the current winning skill set and gear, they at least follow the outfits. For this we have cool examples like the Zouaves of American Civil War fame, as well as the more successful Hussars. In modern times we have everyone dressing up like the SAS. I think that the French Cuirasseurs were doing their Swedish Heavy Cavalry bit ala Gustavus. Ole Nappy loved him some Gustavus, but didn't really have a professional army. Early 19th century muskets had eff all for velocity in any case, especially as noted if not properly loaded. Artillery on the other hand then, was a killer, this was the brief period before the minie ball that it outranged the musket with shot! Totally agree! Napoleon loved Gustavus; to the extent that some historians reckon that Nappy used Gustavus' tactics more than once! Muskets definitly had the velocity of a damp squib, the focus being on trying to break up attacks then take them on with cold Stirling steel!